For the first time I've tried to create something fun and exciting for my nails. It's kind of chaotic having every nail different, but I happen to enjoy them. The theme was geometrics, however it didn't turn out exactly how I wanted it. I'll give it another try for Christmas or New Years and share with you the new results. Till them, hope this gives you some inspiration. Wahoo!All the pictures are amazing. I will definitely recommend this blog to my sister! Two thumbs up! i liked!!! is different and looks very nice! Gorgeous nail art! Love the colours you picked and the design is just incredible! how cute is this nail art! The result looks really nice! Love the shapes. I hope i can do it myself as well. Love your nails so much! You are so talented! I am awful at nail art myself. The fanciest I get is painting my ring finger a different color, haha. You did a great job, I love how your nails look! I am happy if I do as much as paint my nails, let alone do nail art! I think it is pretty impressive. They actually came out really good, Carina! I tried to do just simple stripes on my nails two weeks ago and it was a complete fail, haha! You did a really great job; I love the different patterns and color combo. I can't wait to see what else you come up with! Oh wow these are so cool! Great ideas!!! I like this look, however I could never recreate this! 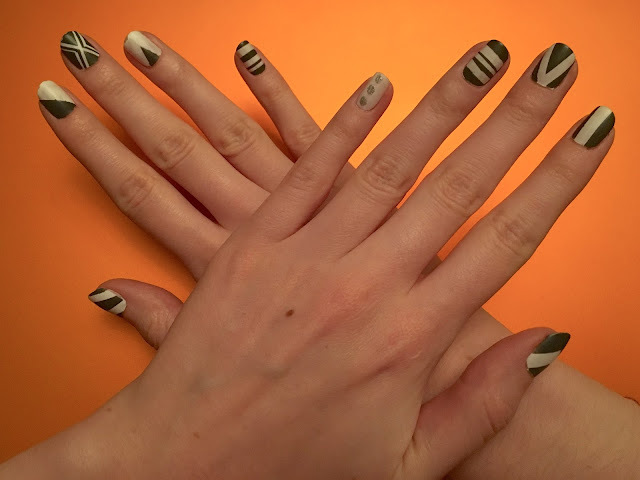 Such a great way to design nails! !